As I mentioned in my Soap and Glory Hand Food review, hand cream is an everyday product for me. I work with a lot of paper, and it really takes its toll on my hands. In the November issue of Marie Claire there was a choice of four L'Occitane hand creams, and I picked up the shea butter one for the simple fact that it was free. It has lived on my desk at work ever since. For Christmas, I received this lovely gift set from Lewis' parents, which I was very thankful for as the hand cream I keep at work is almost gone. 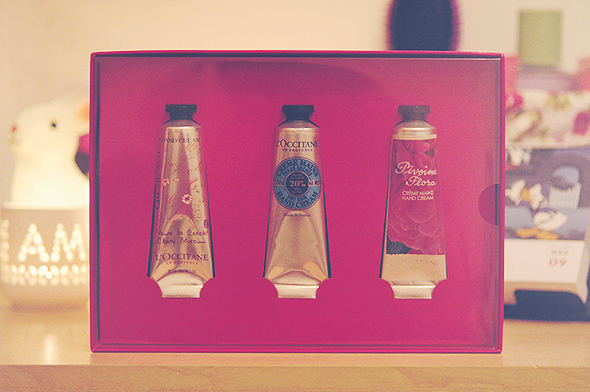 It contains three of L'Occitane's hand creams - Shea Butter, Pivoine Flora and Cherry Blossom. Rich, creamy and extremely hydrating is how I would describe their hand creams. Even when I have the driest of dry hands, these perk them up in a second. Not only that, but the fragrances are simply lovely and exactly what you'd expect from the brand. Cherry Blossom reaches towards a floral/fruity scent, which is subtle but still lingers on the skin, whereas I think the Shea Butter cream has more of a "baby wipe" fragrance and is slightly stronger. Pivoine Flora contains a soft peony fragrance. 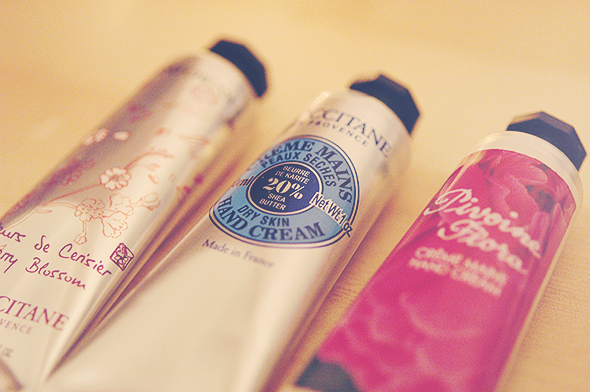 If I were to recommend a hand cream to those with very dry hands, it would be the L'Occitane hand creams, and particularly the Shea Butter tube as it's the thickest of the lot. The 30ml creams are priced at £8.00, or you can purchase a larger 150ml sized cream for £18.50. 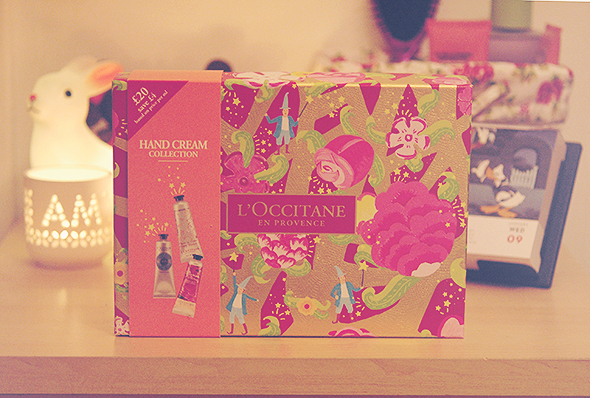 Have you tried the L'Occitane hand creams? Damn, regretting not getting the freebie one now. I did pick it up and then thought... naaah I don't need anymore handcreams!